What if the suffering of the world was our choice? What if whatever we see is just an illusion? What if in heaven there is biggest mansion for us? What if god is weeping for his missing children like us? What if god call us every day but we don't listen? 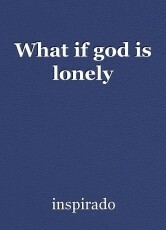 What if god is with us somewhere even in this earth? If god can forget all what you have done and only care about how you're now? © Copyright 2019 inspirado. All rights reserved. I SO ENJOY THE TIME I SPEND MEETING HERE WITH YOU!